Interchampion, Grand Champion of Russia. 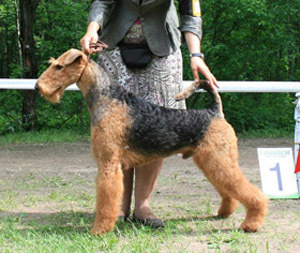 Champion of: Russia, Latvia, Lithuania, Estonia, Baltic States, Slovenia, Romania, Switzerland, Byelorussia, Finland, 4хChampion of Airedale Terrier Club of Russia, Champion of Terrier Union of Russia, Helsinki Winner 2011, Junior Champion of Russia, Junior Champion of Breed 2010, 2хJunior Champion of Airedale Terrier Club of Russia, Junior Champion of Terrier Union of Russia. 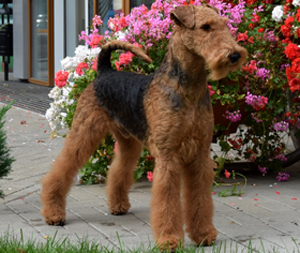 Titles: Interra’2012 Winner, Slovenian Winner, 2nd in champion class of Cruft’s 2013, Champion of Eurasia-1 (2013). 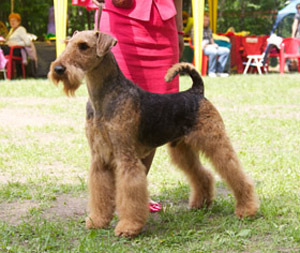 Best of breed at National Specialty 2012. 15хCACIB, 8хR.CACIB, 11хBOB, 3хBIG-1, 2xBIG-3.